Many say Speck’s work even “out masters” the Old Masters. With inspirations like Rembrandt, Caravaggio and Rubens, it’s easy to see why California born artist Loran Speck’s works are so spectacular. His attention to detail is incredible. Notice the fine work on the tablecloth and the pattern on the earthenware jug. They have a photographic quality to them that is hard, if not impossible, to find an equal to. The same is true of his paintings; each is framed in a 22-karat gold leaf frame that he carves himself in his studio. 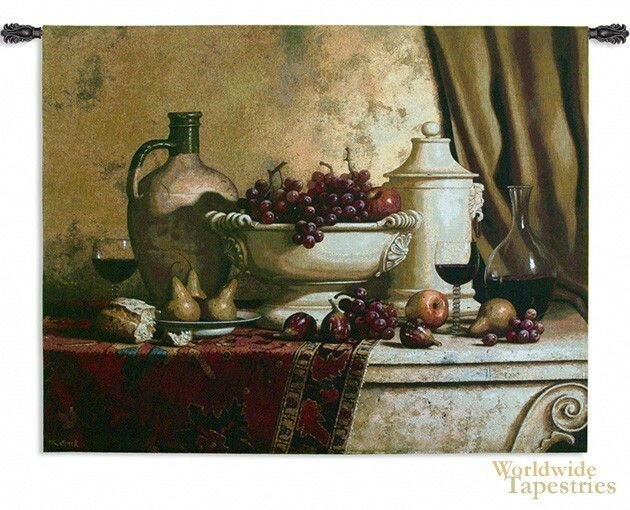 It is that attention to detail that has earned Speck his reputation as one of the finest still life painters. “Italian feast” is a prime example of his mastery of still life. This tapestry is lined and has a tunnel for easy hanging. Note: tapestry rod and accessories, where pictured, are not included in the price. Dimensions: W 53" x H 42"
Dimensions: W 66" x H 53"